Prof Ian White, Master of Jesus and Prof Judith Lieu, Chair of the Wesley House Trustees, exchange contracts – an historic transfer of title in the heart of the city of Cambridge. 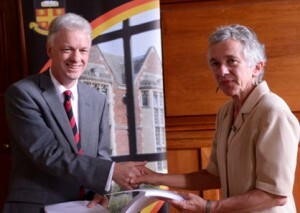 At a formal gathering in the Dining Room at Wesley House Cambridge on Thursday 17th July, Prof Judith Lieu and Dr Derek Nicholls signed and exchanged contracts with the Master and Bursar of Jesus College. The contract returns the freehold of the Wesley House site to the ownership of Jesus College and leases back 40% of the site to the Trustees of Wesley House for redevelopment. The eastern end of the site will be redeveloped by Wesley House. In order to accommodate students and visiting scholars in the Methodist/Wesleyan tradition from all over the world who will come to study at Wesley House in the future the eastern part of the site will be redeveloped to provide state of the art facilities. 1 A new academic gatehouse building will replace the existing 1970s gatehouse. This will house the new library, archive facilities, teaching rooms, dining room and bursary. The building will be wheelchair accessible and include wi-fi access and a reception area for visitors. 2 15 new student units will be built onto the north east corner of the site on the old Principal’s garden. This will also involve the building of a new staircase to service the student accommodation. The other 13 student rooms/flats will be refurbished to modern standards, with ensuite facilities, wi-fi access and new purpose-built shared kitchen/dining rooms on each floor to promote community life. 3 The Principal’s Lodge and the Chapel will remain much as they are with upgrades to services. Building will start in late August and continue for 15 months. 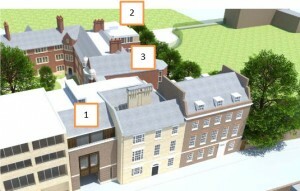 A visual record of building progress can be followed on the Wesley House website: www.wesley.cam.ac.uk. Jesus College intends to redevelop the western part of the site as an outward-facing Conference centre. Plans are being drawn by Niall McCloughlin, award-winning architect and include a new gatehouse on Jesus Lane, terrace to the north and auditorium for 150 and conversations continue about the future collaboration of the two colleges which will be working closely together. 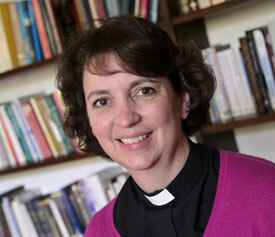 The Revd Dr Cindy Wesley is available to discuss courses with potential students from the UK and from overseas. Meanwhile the staff of Wesley House can be found in offices at 19a Jesus Lane on the usual telephone lines and email addresses. Seventeen students are registered on part time degrees for the year 2014-15 and we look forward in particular to welcoming three new students on the professional doctorate programme, researching an aspect of their practice. At the same time recruitment is beginning for 2015-16 when the building will be returned to the college and full time students can move into residence. A full range of learning opportunities are available from short stay sabbaticals and residential intensive courses for lay and ordained leaders, to full and part time degree programmes. For example, those with at least three year’s experience in ministry who are looking for a course in ministry development might consider one of the new DMin tracks. This is an exciting new joint venture with Wesley Theological Seminary, Washington, taught in short residential blocks in Cambridge. The course begins in January 2016 but is recruiting now. For more information see www.wesley.cam.ac.uk.